One of my favorite shows this season was Mark and Estel who brilliantly combined music and fashion into an unforgettable collection called ‘Stairway to the Stars’. This is also the name of one of the songs Mark and Estel made while making the new collection. This season Mark and Estel sent spectacularly long capes, lots of cool plaid variations, bold graphic print blouses, jumpsuits and flowing dresses down the runway. Mark Tango and Estel Day are both fashion designers and music artists. Combining their passions, they create fashion and music under one name Mark and Estel, the band and the brand. Mark and Estel made fashion and music history as the first fashion designers ever to perform their own songs live on the runway in September 2013, during their RTW debut at Mercedes- Benz Fashion Week, New York. Their fashion collections are created to be wearable versions of their music, and they create and perform all of the music for their runway shows. Of course this season was no exception as Mark and Estel performed one of the coolest post show performances that I’ve ever seen! 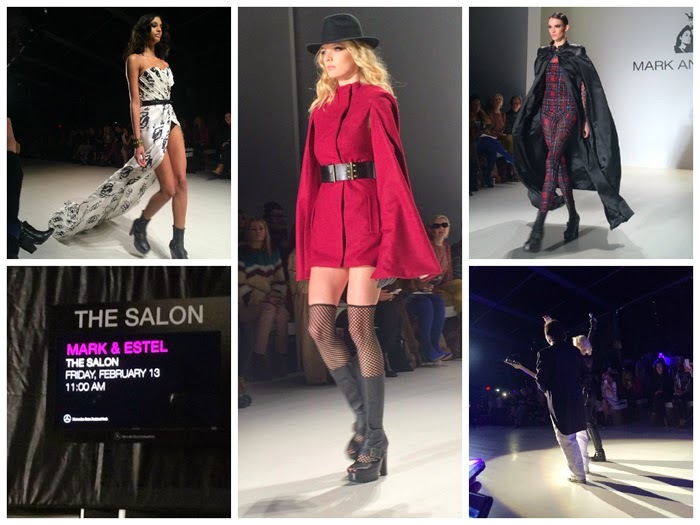 I was so excited to finally see Mark and Estel’s new collection come to life on the runway. Just a few days earlier I was invited for a sneak peek of it so I knew what it would look like but seeing it live was a whole other level. I quickly printed my ticket and headed into the Salon at Lincoln Center for the show. While walking to my seat I came across a fashion mouse (Fashion Stylist Tamika). How amazing was her look?! I quickly snapped a photo and added her on Instagram before taking my seat. Finally, it was show time! The first look was a jaw-dropping long cape which effortlessly flowed down the runway. The cape was the perfect compliment to the cool Mark and Estel plaid jumpsuit and rocker boots. One of my favorite looks was the above red cape dress. I told Mark the moment I saw it a few days ago that I was completely in love with this piece. After the fashion show the lights dimmed and Mark and Estel took the stage for an epic performance. "This collection is about rock and roll style. You’re a rock star! You’re a fashion rock star! ", they belted out in true rock star fashion. Indeed, we all felt like fashion rock stars after witnessing such an unbelievable performance. I can't properly describe the amazingness of the whole show so you'll just need to play the below video to see it for yourself! Alina Fayer is the founder and editor of the TheStyleSocialite.com, a popular fashion/society blog. Originally from Ukraine, Alina moved to the States when she was 8 years old. Her American upbringing and European heritage gives her a unique fashion sense of combining American classics with edgy European pieces. A visit to Maggie Norris’s Couture Showroom + Exclusive Interview about her Fabergé Rosebud' Corseted Egg!